[toc]The reduced muscle tone occurring due to deterioration of motor nerves is referred as Hypotonia. The nerves possess an outer covering of myelin sheath that insulates the neurons and aid in carrying messages to and fro through the brain smoothly and swiftly.But, when this myelin sheath gets damaged due to certain neuronal problems, the signals get impeded, resulting in hypotonia or decreased muscle tone. The other possibility of hypotonia is due to troubles within the connective tissue like Ehlers Danlos syndrome and Marfan syndrome. Collagen from connective tissue provides support and strength to muscle tissues, but during disorders of connective tissue, the much needed support is deteriorated. Certain severe brain infections like encephalitis or meningitis can hamper the functioning of motor neurons. Any spinal cord or brain injury may lead to bleeding within the brain, causing central hypotonia (due to disrupted nerve signals of spinal cord or brain). A serious accumulation of bilirubin in brain of the baby due to jaundice, right after birth may lead to several neurological troubles like seizures, mental retardation, hypertonia or hypotonia. 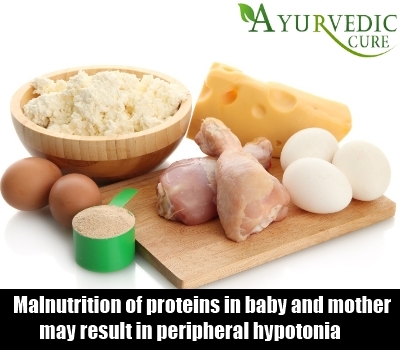 Malnutrition of proteins in baby and mother may result in peripheral hypotonia. In peripheral hypotonia. there occurs nerve damage between the muscle and spinal cord, disrupting the communication between the muscle surface and the neuronal ends, leading to muscle abnormalities. Even if there is lack of adequate amounts of vitamin D in early stages of development of child, the child may suffer from rickets associated with hypotonia. Birth of a premature baby may put the baby at risk of being born with hypotonic muscles. The condition may get resolve as the baby grows further. Low levels of thyroid hormone at time of birth can also cause hypotonia. If it is of severe form, it can develop as Cretinism, where the child develops rough or misaligned facial features and possess retarded mental growth. Moreover, any serious infection of the new born can also lead to hypotonia. Certain genetic disorders like Tay Sachs disease, Down syndrome, Prader Willi syndrome can result in retarded growth, hypotonia and learning difficulties. Tay Sachs is mainly a fatal disorder that leads to progressive neurological damage. In spinal muscular atrophy and Williams’s syndrome, there is progressive loss of muscular movements due to defects in muscle coordination and muscle weakness. Charcot Marie Tooth disease is an inherited disorder that damages the myelin covering of the nerves and the disorders of connective tissue causes defects in cartilage that is no more able to support other organs and tissues, resulting in hpotonia. 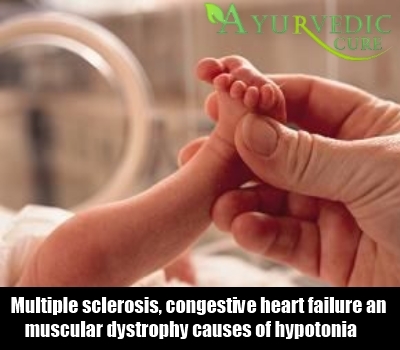 There exist many more causes of hypotonia like hypoglycaemia that leads to muscle floppiness, Myasthenia gravis that cause disruption in neuronal network and muscles, affecting the neuromuscular junction and leading to increased fatigue and weakness. Babies born from mother with myasthenia gravis may show hypotonia from birth itself. Certain storage diseases, cerebral palsy, multiple sclerosis, congestive heart failure and muscular dystrophy are the other causes of hypotonia. In multiple sclerosis, myelin sheath gets damaged and muscular dystrophy results in progressive weakening of muscles and disability.